The Pillow Book is a book written by Sei Shōnagon c. 994. Sei Shōnagon was a member of the Kiyohara family. 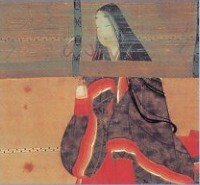 She wrote the notes that made up her diary (or "pillow book") while she was a member of the court of Empress Sadako. The book is a classic of Japanese literature. It is one of two of the greatest examples of prose literature of this time period. It is a collection of pieces of writing that vary from one or two sentences to several pages. It is the author's observations of people, life at court, and nature. This page was last changed on 31 August 2017, at 13:23.